And there it was, another conversation (with a man) about how men are predominantly, initially, and primarily attracted to a woman for her physical beauty, and how my qualities, though “superior”, are secondary and therefore I am overlooked, and never given a chance. Just shovel that right on top of the heap of emotional garbage that has been increasing as my waistline decreases. In the days after to say that I was pissed would have been an understatement. I was pissed at everyone. Seriously. Even men I haven’t even met yet. Yep, I was pissed at them, too. Salve to a weary,angry, achy heart. As my heavenly Father speaks, all I can do is listen. ………And there you are. In your unassuming shell. Feeling overlooked as shiny shells get chosen,claimed,collected. That is of no concern to you. 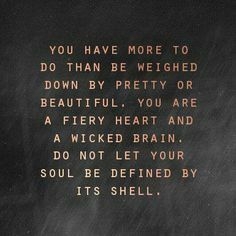 Do not let your soul be defined by its shell. You my dear are growing slowly. Delicate. Fragile. Sensitive. Layers and layers have developed around an irritant. The greater the layers, the greater the lustre. You reflect light, and you have an inner glow. You shine brightly. You reflect those near you clearly. You are authentic and very rare. Often imitated, never replicated. You are a treasure. Those who know what they are looking for will know how to find you and appreciate you when they do. Until then you remain tucked away, hidden, protected from predators. I love you, for you are my Pearl.